It’s the last day of summer and we have an announcement! 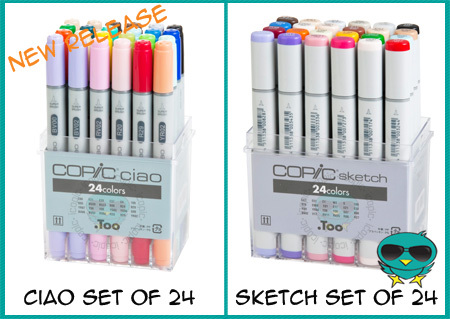 The newest set of Sketch and Ciao Markers are making its way to us now and all preorders will be available for shipping Friday, September 24th! Each set provides a combination of our best selling classic colors and an array of skin tones that work and blend perfectly together. We know some of you are still enjoying nice warm rays from the sun while others are already experiencing shorter days and cooler breezes. A quick reminder that our Fall Challenge #4 is well under way and are blown away by the beautiful submissions thus far! oooh....how much are each set going to be? Sketch set is $116.82 and the Ciao set is $77.22.